Habitat Apartments reply: Thank you for your compliments. It has been a pleasure delivering our quality service to you. We are looking forward to welcoming you again. Thank you! Appartamento comodissimo per spostarsi grazie alla fermata del metro sotto casa e pratico con numerosi negozi a pochi passi. L'interno è nuovo e completo di tutti i servizi e comfort. Assolutamente una buona scelta.-- Habitat Apartments reply: Grazie mille per il suo commento positivo, siamo lieti che il soggiorno sia stato all'altezza delle sue aspettative. Speriamo di poterla accogliere nuovamente in uno dei nostri appartamenti. Thank you! I like that the apartment was very close to metro stations. It was comfortable and clean. It is supplied with kitchenware and towels. However, we had to go and buy our own toilet paper when we ran out since there wasn't any extra supplied. It is in a nice neighborhood and very close to the Magic Fountain and Montijuic. The apartment ADN 21 is located in Sants area. Metro stop - 163 m.
Metro stop - 304 m.
Plaza de España - 0.36 km. Fira de Barcelona - 0.48 km. Foundation of Joan Miró - 1.62 km. Nice, clean, well equipped and modern apartment. 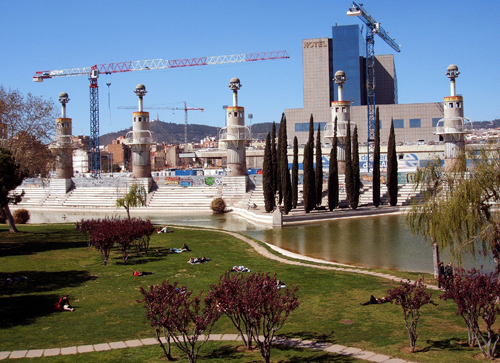 Close to the metro station, market and Espania square. Sofia was waiting for us at the agreed time, she was very nice. We received a required explanation about the apartment and arranged the payment with her. The only drawback is the lack of thick blankets for sleeping in the apartment, we did not receive them even after I asked. It was cold to the kids at night, so finally we used our blankets we had with us. Nice apartment, bus and subway nearby. A bit noisy from traffic, but all over we Are pleased with out stay Therese. The suite and location is perfect. As an international guest, I hope I can check-in as soon as possible. Even I called your phone number 2 hours before I arrive at the door of apartment, I still needed to wait for 1 hour. I called the phone number shown on the door, but nobody answer. So I suggest you can set up ONE phone number can solve everything. Excellent location. Nice and clean apartments. Everything was fine. Really comfortable for 4 people family. Very good modern apartment very close to Pl. Espanya and a metro station. Great huge food market a few doors up and a bakery. The apartment has a nice layout with a small balcony at the front and at the back. Good appliances and dishwasher tabs a nice touch. (Washine machine ones would have been nice too). Everything else you would need is there. Good comfy beds and nice linen. Everthing spotless and the cleaner was excellent and very pleasant. The check in was smooth and on time. Nice apartment, clean, close to metro,and overall a decent area, value for money. The bedrooms don't have much space for clothing, bring your own hangars, and no draws. The kitchen seamed well supplied, but we ate out every night. The apartment was wonderfully located, 5 mins from the aerobus stop, next to the hostafrancs market and the metro stop and plenty of cafes and eateries around. The area was great! Unfortunately, the one thing that made us not want to stay in this apartment for future trips is the paper thin walls. The floor boards were so thin, we could hear our neighbours upstairs walking, talking and moving things, most times through the early mornings. This made our stay very unpleasant. Ich war in der Zeit vom 04.04. bis zum 09.04.2015 mit meinen Kindern (11 und 14 ) in diesem Apartment. Ich hatte bedenken und war sehr positiv überrascht. Wir wurden sehr herzlich empfangen und gut informiert. Das Apartment hat alles, was man für einen Aufenthalt braucht. Aber ein Abzug gibt es für den nicht vorhandenen Backofen. Direkt vor der Tür hatten wir den Touristik -Busstop (Rote Rute). 20 m weiter war die Metrostation. 500 m weiter war man auf dem Palaca Espanya. Empfehlenswert. Goed, centraal gelegen appartement. Het was schoon en zag er fris en modern uit. Het is zoals de foto's laten zien. Met 6 personen zou het wel klein zijn. Wij waren met vier personen. Dat was prima. Goede service, vriendelijk welkom. Alles goed geregeld! Voor een volgend stedenbezoek zullen we zeker weer op de site van Habitat zoeken. Thanks a lot! The apartment was absolutely great! It's new, clean and very comfortable. We were provided by everything we need like cleaners, iron, coffee machine, juicer, toaster. We also had two cute balconies. Definitely will stay in the habitat apartments in the future! Apartment in Barcelona with lovely terrace located in the Sants district, next to Plaza España. For those looking for a place to relax close to Barcelona centre. It can comfortably accommodate 6 people.